An adults-only oasis set amidst gardens of trees and tropical flowers, Sunset at the Palms provides an intimate and serene all-inclusive experience. 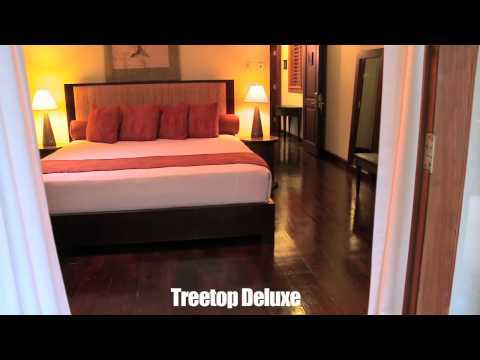 The large and airy Tree Top Deluxe Rooms are set amidst the tropical gardens of the resort. High peaked bleached-wood ceilings are graced with a wood-paddle ceiling fan and large wooden-louvered windows line the walls. Balinese decor of dark-wood flooring, canvas drapes, tapestry pillows, floor mats and bed throws complement the king sized platform beds. All rooms feature mini-bar stocked daily with water, beer and soda; his and hers bathrobes; individually controlled air-conditioning, armoire with TV with U.S./European cable channels, desk and cushioned chair and direct-dial phones. Rooms are non smoking and roll away beds are available upon request. The sleek, modern bathrooms feature slate tiles, chrome fixtures and glass enclosed showers with four body jets and two shower heads, slate bench with handheld shower head, and a contemporary basin sink with chrome faucet set on the marble-and-wood counter. The private, weathered-wood veranda features a relaxing daybed and two-chair teak dining set. The large and airy One Bedroom Suites are set amidst the tropical gardens of the resort. High peaked bleached-wood ceilings are graced with a wood-paddle ceiling fan and large wooden-louvered windows line the walls. Balinese decor of dark-wood flooring, canvas drapes, tapestry pillows, floor mats and bed throws complement the king sized platform beds. An adults-only oasis set amidst gardens of trees and tropical flowers, Sunset at the Palms provides an intimate and serene all-inclusive experience. Awaken each morning to the sounds and scents of nature. Here, time stands still and serenity reigns. The intimate, all-inclusive Sunset at the Palms offers quaint treetop accommodations in an environment so tranquil and calm, it will leave you breathless. Sunset at the Palms features well-appointed guestrooms, new amenities and lush landscaping. Just 85 treehouse-style guestrooms stand in a ten acre tropical garden, a design praised by Architectural Digest. And its all just steps from the resorts five beachfront acres, which provide two miles of white, sandy beach and a private beach bar and grill. All rooms have balconies and are set in a tropical garden. Other room amenities are TVs with premium satellite channels, complimentary wi-fi, signature toiletries, irons, ironing boards, air-conditioning and ceiling fans. Turn-down service is offered nightly and housekeeping is available daily. Lotus Leaf: Open for Dinner from 7:00 P.M. to 10:00 P.M. Reservations required. Open four nights a week. Enjoy the air-conditioned Lotus Leaf a la carte restaurant, offering an eclectic fusion menu with an Asian flair as well as international favorites. The restaurant is located just off the resorts main lobby and makes an ideal romantic evening. Palm Breeze Bar and Grill: Open Daily from 10:00 A.M. to 6:00 P.M. Spending a day at the beach? Delight in an array of simple pleasures, great sandwiches and grilled favorites including Jamaican Jerk specialties, plus a friendly bar staff serving ice-cold Red Stripe Beer, tropical rum drinks, fresh fruit juices, soft drinks and refreshing smoothies. Chefs Showcase: Open for Dinner from 7:00 P.M. to 10:00 P.M. Reservations Required. Open five nights a week. Dine under the stars and let our culinary team delight you with recipes developed by team to include locally grown fruits and vegetables and combining the best of traditional Jamaican cuisine with a Mediterranean flair. Bamboo Bar: Open Daily from 10: A.M. to 1:00 A.M. Swim right up and enjoy a refreshing cocktail, pull up a seat by the bar or lounge by the pool, all while you enjoy an array of your favorite tropical concoctions, juices and an assortment of beverages the ideal setting for winding down the day, mixing with other guests or the perfect start to a casual evening. Irie Martini Lobby Bar: Open Daily from 6:00 P.M. to 11:00 P.M.
Sip a martini made with Jamaican Appleton rum in the Irie Martini Lobby Bar. Gather before dinner at the sweeping bar carved from Caribbean purple heart wood and soak in the sounds of the soothing live piano music from our resident baby grand. Blue Coffee Bar: Open Daily from 7:00 A.M. to 10:00 P.M. Choose from an amazing array of freshly brewed coffee concoctions. Featuring Jamiacas own Blue Mountain coffee. Try our specialty: Rumachhino.